I felt very prepared and confident with the rifle John Pierce built for me going into this match. 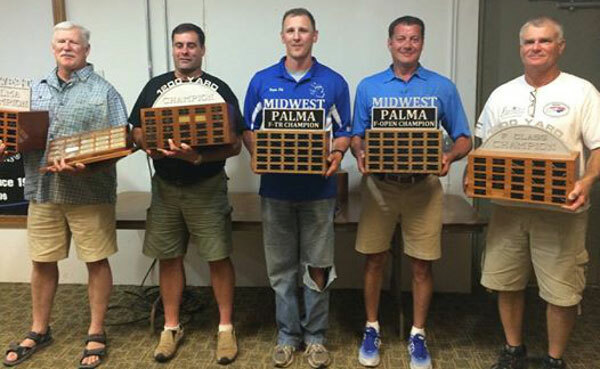 I’ve been coaching the Michigan F-TR team for a while and finally decided to participate in the competition. F-TR is more rifle-centric than Palma, meaning the precision demands are greater due to the smaller scoring rings. 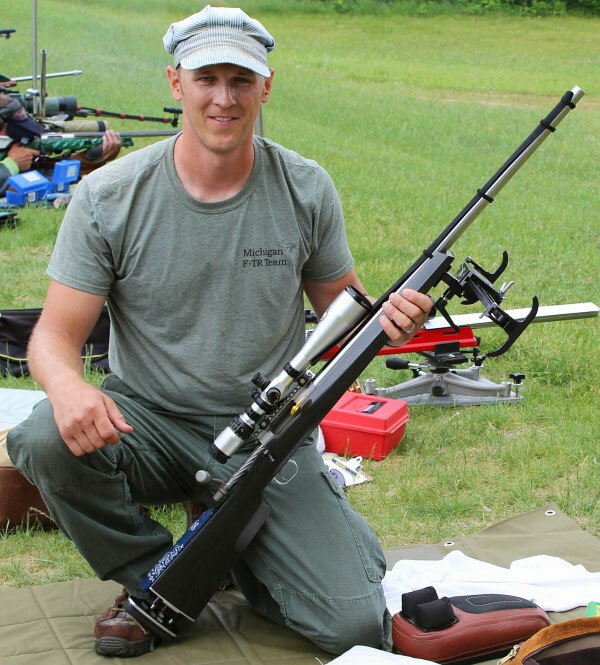 After seeing Eric Stecker’s results with his Pierce rifle at the 2014 Berger Southwest Nationals, I asked my good friend and Michigan team-mate John Pierce to “build me one like Eric’s.” This is the same basic set up as John’s own F-TR rifle as well. It’s a Pierce F-TR action with a 30″ long, 1:9″ twist Bartlein Barrel chambered for the Berger 215gr Hybrids. The barreled action is bedded into a light-weight, BR-style stock built by Bob Scoville. A Phoenix bipod underneath and a Nightforce 15-55X Competition scope completes the package. I received the rifle just one week before the Midwest Palma match. During that week prior to the match, I put over 700 rounds on the rifle. I did some load development but was mostly learning to shoot a new rifle in a new discipline. I decided on 215gr Berger Hybrids seated 0.015″ off the riflings over a stout charge of Varget in Lapua Palma (small primer) brass with CCI BR4 primers. The only brass prep was mandreling the necks of the new brass for consistent neck tension. The bullets were slightly pointed, but nothing was segregated by weight, base-to-ogive, or anything. All the ammo I shot in Lodi was loaded in brand-new Lapua brass. I love the way this Pierce F-TR rifle flings brass and wins tournaments. None of my sling guns ever had an ejector. With this rig, it’s become one of my favorite things to eject the brass and just let it fly! Coming over from sling shooting, I knew there would be unique challenges to F-TR which I wanted to learn prior to (not during) a major tournament. I learned a new shooting position which doesn’t involve drawing the right knee up. For F-TR I get more straight behind the gun rather than at an angle. I found that the rifle shoots best with very light cheek, shoulder and grip pressure, approaching free recoil. 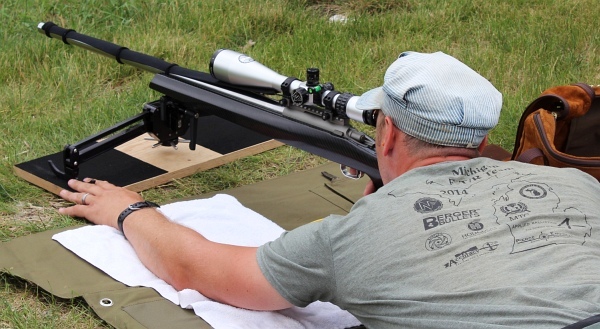 This is how Eric Stecker shot his similar rifle into second place in the SW Nationals. I learned the rifle’s sensitivity to different bipod and rear bag supports, and found the best buttplate position to allow the rifle to track and stay on target after recoil. This set-up shot best with a mostly free-recoil approach, that means “hovering” over the comb, rather than resting your head on the stock. This took some “getting used to” in terms of neck and back muscle tone. These are the kind of details I think it’s important to focus on when entering a new discipline. There were no problems at all with the equipment, and I just shot the rifle the way it liked to be shot. I think many shooters consider themselves ‘ready for a match’ the first time the rifle shows them a couple 1/3 or 1/4 MOA 5-shot groups from a bench at 100 yards. 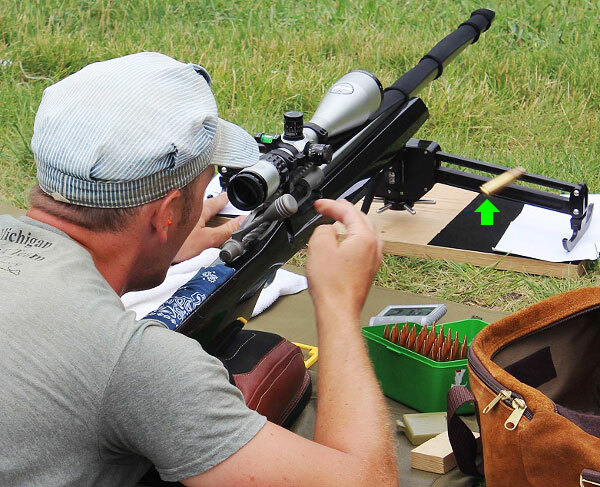 While making the rifle shoot precisely is certainly a prerequisite for successful match shooting, it’s certainly not the whole story. So as soon as I got the load and rifle shooting 1/2 MOA from the bench, I proceeded to shoot many 10- and 20-shot strings from the ground at 300 and 1000 yards. I shot more than 500 rounds this way, studying the rifles character, and learning to shoot it. It’s amazing how much the precision (grouping) is affected by subtle variables in the set-up, especially when shooting heavy bullets. I truly believe that many F-TR rifles are hindered in their precision potential by something in the way they are set up and shot. 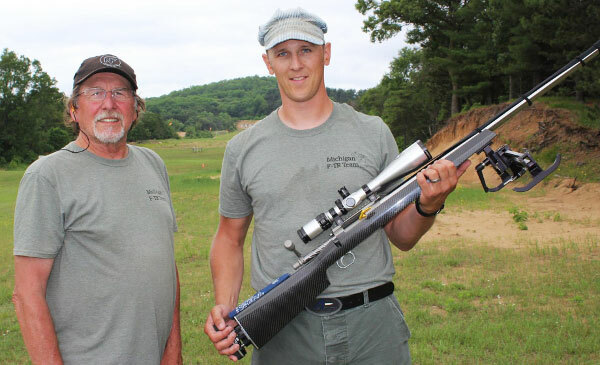 Here I am with John Pierce and the epic F-TR rifle he built for me. This thing shoots 1/2 MOA Vertical at 1000 yards. I believe F-TR set-ups are way more forgiving with light- to medium-weight bullets (155 to 185 grains). By this I mean that it’s easier to shoot good groups with a variety of bipods, rear bags, etc. But as you get into the 200 – 215 grain bullet weights, the precision of the rifle (i.e. group size) becomes very sensitive to set-up and shot execution. I was able to find a good set-up which let the rifle shoot very well on a variety of surfaces (hard gravel, soft grass, sand, etc.). In Lodi, the rifle shot well all week. Having done so much preparation and training with the rifle the week prior to the match, I felt very prepared and confident. The results were actually better than expected. There were no problems at all with equipment, and I just shot the rifle the way it liked to be shot. In the end, I won the F-TR Division. I can say there were many shooters interested in the Pierce rifle! I’d like to thank John Pierce for building a great F-TR rifle and thank my dad, Bill Litz, for loading the best ammo on the planet. Finally, I’d like to thank the Michigan F-TR team for helping me learn how to shoot F-TR. In the end, I won the F-TR Division. I was in first place each day of the match, including the 3×1000 on Friday where I averaged over 195-7x. This article was also featured on AccurateShooter.com.